Surround yourself with some of the most amazing views of South Lake Leelanau from almost every room of this lake front property. Unique rental property with a home, separate guest cottage, and a 650 sq. ft. bunk room. 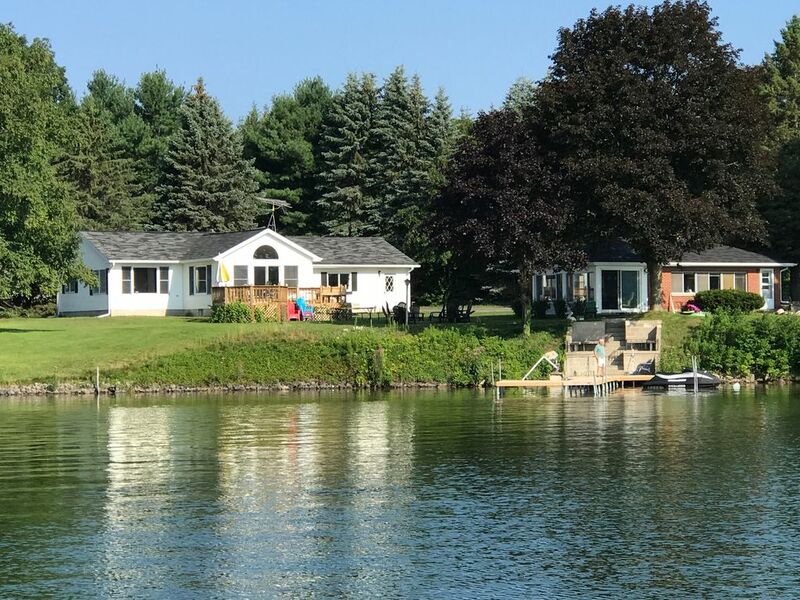 Large property with 201 feet of private frontage on South Lake Leelanau, great for swimming and situated on a point allowing for expansive lake views and an abundance of recreational opportunities. As new owners, we purchased the property in November 2016 and have made updates to the property through the winter months to prepare for your visit. Our goal is to provide you with a vacation setting that serves as your personal gateway to fun and relaxation with the hopes that you will return to vacation with us again in the future. with fresh paint and color schemes, touches of owners personal charm, updated furniture and boasts a refreshed lake house theme. Home includes a newly constructed bunk room that will sleep 6 complete with new full bath and equipped with social/media area guaranteed to be hit for any age. The social/media area will has casual seating with flat screen TV, cable/DVD (PS3 player) with a multitude of movies. The garage has also been decked out to serve as a great gathering space of fun for your family/friends equipped with casual seating areas and rustic bar area to enjoy snacks/refreshments, and/or games. A great place to share some laughs while competing or simply chillin' as a spectator. Two Bedrooms and one full bath with fully equipped kitchen (with Keurig Coffee maker) and 2 family room areas. *Main living space is equipped with a large flat screen TV, DVD player and cable. *A large sliding glass door gives you access to the spacious deck and brings you within 50 feet of the Lake Leelanau shore line. *Bedroom 1 sleeps 2 and is furnished with an inviting king size bed with solid wood panel headboard/footboard. *Bedroom 2 sleeps 2 or 3. Both bedrooms have closets with full mirrored slider closet doors. The guest cottage offers you lakeside cozy charm and is nestled within 25 feet of the waters edge. You won't want to leave the large sun porch as you gaze down the spectacular south lake view. Step outside the porch area and you will find a nice patio to enjoy your morning coffee as you witness the beautiful sunrise over the lake. Once inside you will find 2 bedrooms, full bath, and small but fully equipped kitchen complete with stove, microwave, fridge, dishwasher, and coffee maker. The living room area has a flat screen TV with Cable. This room also has a door with access to the waterfront. Bedroom 1 has a queen size bed. Bedroom 2 has two twin beds and will sleep 2. Both cottages offer ranch style/single level living which means easy access to living areas and outdoor fun. This property gives you privacy yet an abundance of gathering spaces to create vacation memories to last a lifetime. Enjoy sitting along the waters edge on the sunning platform as you descend down a few steps to the dock. Here you will see the crystal clear water and packed sand bottom just waiting for your water recreation activities. Rent a pontoon, kayaks or bring your own water toys to maximize your lake vacation experience. This property also offers you an abundance of outdoor space for yard games and a picnic table to share outdoor meals. Additionally, a vacation retreat would not be complete without a lakeside fire pit for those evening gatherings while enjoying the night sky and yummy s'mores. The location of this property is one of the prime locations in Leelanau County, but you may find this 201-foot waterfront property is hard to leave. Lake Leelanau is a 23 mile long, all-sports lake with crystal clear water and natural sandbars excellent for swimming, kayaking, paddleboard, waterskiing, and boating. The lake is also known for its exceptional walleye and smallmouth Bass fishing. * Abundance of skiing, biking, and hiking trails. Don't miss this opportunity to enjoy this spectacular rental opportunity. Greg and I both had a love for the Traverse City/Lake Leelanau area when we were very young. Greg is originally from a small town in southern Michigan and often spent summer vacations "up north" near Interlocken. I lived my whole life in the UP of Michigan until last year at which time I moved to the Detroit area. When we toured the property, we instantly fell in love with the cottages and the location...the views are spectacular and bring peace to your soul and fresh air to your lungs. To us it represents much of what we missed about our childhood and hometowns...the beauty and peace of natural surrounding, an abundance of outdoor recreational opportunities, and room for the whole family to enjoy special time together creating memories. We are very excited to be able to share our UP North "get away" with you. Garage will be converted to a Game/Rec room ping pong, Dart board and Ring toss presently with more items to be added as we purchase them. Wonderful place. Had a couples weekend away from kids. It was great to have the 2 houses and also the garage was a big hit for games/ hanging out! Very nice lakefront property, big yard, nice dock. The lake is very nice for kids. It is shallow around the dock area which is great for little kids. Thank you for being our guests! We are glad to hear the property was good fit for your family. The view of the lake from the houses was incredible! Great place for a family vacation. From the moment we drove in we loved the location. It was a beautiful view of the lake and the entire area. Just a few steps to the lake to swim or relax on the dock. The main house had every amenity you could want. The bunk room where our 5 grandsons stayed was a wonderful room for the boys. Lots of room to watch TV and sleep. Their bathroom was amazing! It was new, clean and the kids loved the shower. The game room area was good for storing all our supplies and playing ping ping. The guest cottage is so cute. Perfect for grandma and grandpa. We had dinner on the deck in the evening and a fire in the fire pit every night. S’mores were the nightly treat! The location was close to Traverse City, the Sleeping Bear Dunes National Park, the dunes and dune climb, Lake Michigan beaches, the Beach Bums Baseball Stadium and wineries and breweries are close by. A great place for a family vacation. The owner was available to answer all our questions and responded quickly. We look forward to going back for another vacation there in the future. A sincere thank you for your lovely review. We are thrilled that you enjoyed your time with your family and found the location and accommodations a great fit! It truly is a special place and it brings us joy to be able to share it with other families looking to create some wonderful memories to last a lifetime. Every detail of our stay was exactly what we had hoped. Beautiful, clean, spacious, fun, accommodating, and Stacie was incredibly communicative when we had questions. Everyone in our party said 10/10 would rent this property again! We're already thinking up future plans. A sincere thank you for your comments and feedback. We strive to make your stay an excellent guest experience for you and all members of your group. We enjoyed having you as our guests and hope you will join us again sometime. The house and cottage were wonderful to stay at. Our entire family went up and the extra room was very accommodating. The location is extremely close to vineyards and towns, which made little daytime trips enjoyable and convenient. They have a converted garage into a rec room, which we had a great time playing ping pong and corn hole. We would definitely stay here again. Thank your for being our guest and for your comments about your experiences at the cottage. We are very happy that you enjoyed your time in Lake Leelanau ....it really is a special place and brings us much joy to have others enjoy it with thier families and friends. We had a family reunion week here and had a wonderful time. The small brick cottage (which was really roomy!) fit my family of two adults and three kids very well. It was cozy, the a/c worked well, and had everything we needed. The big house was the hangout spot, with great views, a huge living space, big kitchen, and a great deck! Above all, though, Lake Leelanau was amazing. Clean and shallow by the dock. Calm enough for lots of kayaking and paddle boarding. Plus the little dug out area by the dock has lots of shady seating to watch the little ones splash in the water. The lake was lively but never crowded. We saw our neighbors but felt like we had a very private space. Overall, it was a fantastic getaway. Thank you for being our guests. We are thrilled to hear that the cottages suited your family well and that you enjoyed your vacation on Lake Leelanau.